SOUTHERN CALIFORNIA WAS FERTILE GROUND for the Arts and Crafts movement, which called for simple living, closeness to nature, the unification of art and craft, and regionally appropriate forms of architecture. The movement influenced a number of important architects working in Southern California and produced a wide array of houses, churches, schools, and other buildings that reflect Arts and Crafts values. 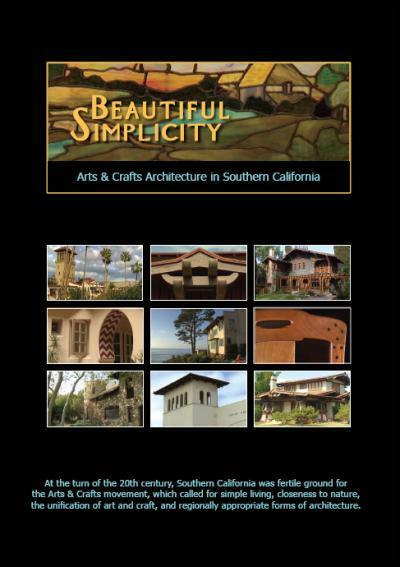 Beautiful Simplicity: Arts & Crafts Architecture in Southern California examines the rich body of Arts & Crafts architecture in Southern California, from Santa Barbara to San Diego. It introduces viewers to more than a dozen architects who pursued Arts & Crafts ideals, including Charles and Henry Greene, Irving Gill, Arthur Benton, Sumner Hunt, Frederick Roehrig, Louis B. Easton, Sylvanus Marston, Arthur and Alfred Heineman, Frank Mead, and Richard Requa. The 86-minute, wide-screen documentary offers commentary by noted historians and other knowledgeable observers, including Robert Winter, Cheryl Robertson, Richard Guy Wilson, Edward Bosley, Walter Judson, Tim Andersen, and Lucinda Cooke. The production notes the influence of prominent Arts & Crafts figures like John Ruskin, William Morris, Gustav Stickley, and Elbert Hubbard, as well as the passionate advocacy of local leaders like Charles Fletcher Lummis and William Lees Judson. Beautiful Simplicity also highlights the significance of the Craftsman bungalow, which helped democratize home ownership in America. Historically significant structures featured in the production include the Mission Inn in Riverside; the Charles Lummis house, El Alisal, in Highland Park; the Judson Studios in Garvanza; the Arturo Bandini, Arthur Eddy, Duncan-Irwin, James Gamble, Volney Craig, C.L. Parsons, and Mary Hindry houses in Pasadena; the Church of the Angels, St. Francis Court, Bowen Court, and Polytechnic School, also in Pasadena; the Curtis Ranch in Altadena; All Saints-by-the-Sea Church in Santa Barbara; the Krotona Institute of Theosophy in Hollywood; the Waldo Waterman, George Marston, Mary Cossitt, Russell Allen, Wheeler Bailey, and Robert Windsor houses in San Diego; and the La Jolla Woman�s Club, Palomar Apartments, and First Church of Christ, Scientist, also in San Diego. Beautiful Simplicity: Arts & Crafts Architecture in Southern California was produced by Paul Bockhorst Productions in cooperation with the Society of Architectural Historians, Southern California Chapter, with principal funding from The Ahmanson Foundation and the Joan Irvine Smith and Athalie R. Clarke Foundation.